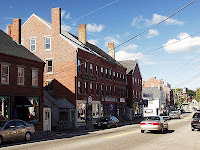 Our 6th winner in our Seeds for Schools program takes us to the state of Maine, in the town of Damariscotta, to Great Salt Bay School. Great Salt Bay is for students in Kindergarten through 8th and all grades are involved in the school’s gardening club. The 5th through 8th graders have taken it a step further and for students in those grades there is a gardening club. The school boasts a greenhouse and a variety of raised beds where they have grown plenty of herbs, garlic and many different varieties of greens. Great Salt Bay faculty are hoping to connect the use of their garden, gardening club and the growing of fruits, veggies and herbs to their science, social studies, math and history lessons (plants grown during specific periods in history). Future plans also include assigning students writing and research projects where they go out and find out more about the origin of what they are growing, nutritional value and more. Great Salt Bay hopes that the seeds they will receive will allow them to grow enough to stock the school kitchen and also to be used by their cooking club. They educate students about good nutrition and the role of local gardens and farms in promoting healthy, sustainable communities. San Jose is well represented this year in our Seeds for Schools program. Allen at Steinbeck is 1 of 2 schools chosen from the San Jose area (we will talk about the other San Jose winner, later in the week). 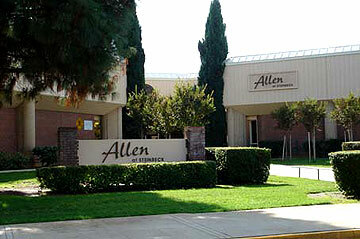 Allen at Steinbeck is a large urban area school catering to the Kindergarten through 8th grade student body. Their gardening program was started 6 years ago when they moved into their new building and includes 8 beds where they have been growing plenty of herbs, veggies and pumpkins. "We work with each grade to get kids into the garden going through the entire planning, weeding and harvesting process," says Shawn Shahin, a teach at the school and submitter (along with Kristen Corpuz) of the application. "The pumpkins we grow are used each year to decorate our school." Allen at Steinbeck plans on using the seeds they will receive as a means to teach more indoor gardening, starting seeds indoors and of course to get more kids gardening. They would like to use "garden time" as a positive reward for their students. The mission of our 4th winner in our Seeds for Schools program, Bullard Elementary, in partnership with family members and their community, is to provide a foundation which fosters integrity and lifelong learning while developing responsible, productive members of society. Who can argue? The Kennesaw, GA based elementary school which caters to K through 5th, just recently won an award from "Keep Georgia Beautiful" for the creation of their school garden. "We try to incorporate the support of the community, scouts, students and parents, and our active PTSA," said Lorelle LoCurto, the submitter of the schools application to the seeds program. "Having the opportunity for all children to have such hands on learning would be valuable." Bullard Elementary, which was just recently featured in the Duluth weekly for winning this program, has big plans for the seeds they will receive. They are going to implement GA science into their K through 5 curriculum to give the students a better hands on experience. Located in Charlotte, NC, about 10 minutes from the bustling downtown area, and boasting a student body of 422, Allenbrook Elementary school is our Seeds for Schools program's 3rd out 10 winner. Their gardening program is new for 2012 and was initiated after Tina Cataldo (the school's recycling coordinator, and application submitter) decided it was time to expand the school's environmental program after they had already began teaching the students composting techniques with the help of Senior Environmental Specialist, Nadine Ford. "We are hoping that the gardening project will extend from a learning experience to a useful community garden for the families who live within the Allenbrook Elementary school community," says Ms. Cataldo. "Our hope is to establish the garden and involve family members who will contribute efforts to maintain the garden over the summer months (as well as during the school year) and be able to reap the benefits of the garden for their families." To accommodate their new gardening program for the students, Allenbrook is building four raised beds, which will be plenty of room to teach the students (and families) how to grow fresh, vegetables, fruits and herbs from the seeds they will receive. 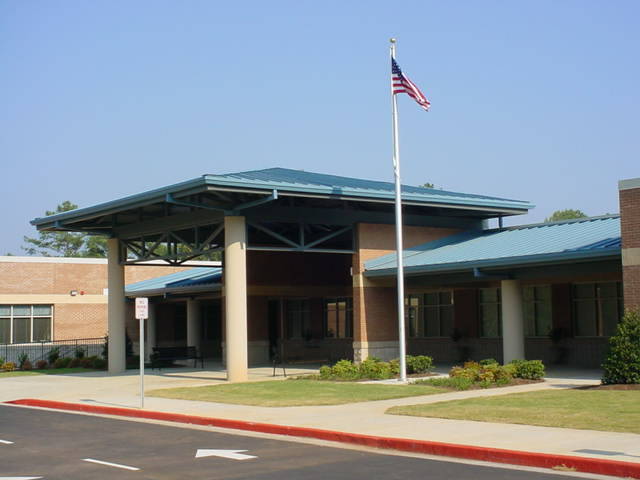 Blackwell Elementary school is located in Marietta, GA and was founded 80 years ago. Their gardening program is fairly new, started only last year, by many novice but passionate teachers who were inspired by their assistant principal, Pam Roach, after she started the program. "Our teachers finance so much of their classroom needs as well as the needs of our new gardening program," said Lisa King, a counselor at Blackwell as well as the person who submitted the application to our Seeds for Schools program. "This subscription is going to greatly improve the gardening program here." Ms. King says she is excited about what gardening brings to the school, her own life and sees how the growth of the garden is leading the students to their own growth. Ms. King uses the school garden as means to teach the students goal setting as well as a means to establish "eco-therapy" groups at Blackwell. Over the course of the next 10 days, we are going to feature our 10 winners from our recent Seeds for Schools campaign. All winners were chosen from hundreds of applications submitted during our open enrollment period for the program and will receive a 3 year membership to Mike the Gardener's Seeds of the Month Club. The choices were tough as there were so many schools that were excellent candidates. We wanted to feature each winner daily to give you a better idea of who they are and the gardening programs they use to teach the children in their schools. 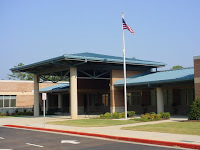 Ravenna High School is located in Ravenna, Michigan which is about 3 and half hours west of Detroit. At 100 years old, Ravenna is committed to a quality and rigorous education that enables their students to be prepared for the challenges that they will face in the 21st century. Ravenna's application was submitted by Melanie Block who has been teaching agricultural science since 2000. Their school garden was started in 2001 with the construction of their greenhouse. Ms. Block's philosophy is hands on teaching when it comes to plant science and the school garden gives her and her students just that. And who can argue? She has been named Michigan Agriscience teacher of the year ... twice! In 2000, Ravenna's agricultural program had only 22 students and today that number hovers near 200 which is nearly the entire student body! "When I told the students we had been chosen as one of the winner's, a big cheer went out throughout the class," said Ms. Block. Now, Ravenna's students are eager to plant some seeds and get their hands dirty. Do not let the lack of space be a reason or an excuse to not have a vegetable garden at your home. Thousands of people are in the same situation as you and that is the space they have available to grow fresh fruits, vegetables and herbs from seeds is very limited. Maybe you live in a big city and land available is scarce, or you reside in a condominium or apartment and the only thing available to you is a patio. Either way, there are some great solutions to help you through this. You can be growing your own fresh veggies in no time. 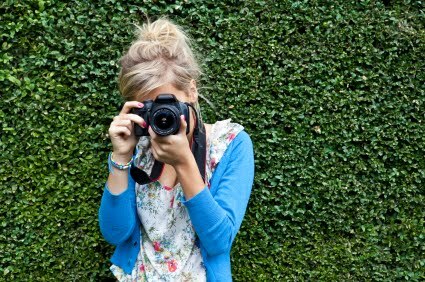 I recently spoke with Tracy Godsey who runs the small container blog Eden’s Container. Tracy started her small space vegetable gardening adventures when growing fruits, vegetables and herbs in containers is all she could do with her limited apartment space, which consisted mainly of a balcony. Tracy reminded me of a very important factor that I had not thought about and that was the weight of what you are growing. If you are on a second floor balcony where weight will be an issue, Tracy recommends, selecting smaller heirloom varieties and grow them in hanging baskets. Just because you are limited on space does not mean you are limited on what you can grow. Remember to select fruits, vegetables and herbs that you and your family will consume. Since space is a premium you do not want to waste any with items that will get discarded. Be careful not to over water your items in containers and make sure your containers have adequate drainage holes. To protect from the loss of dirt through those drainage holes use coffee filters at the bottom or paper towels. Both options allow water to pass through but not dirt. Now it’s your turn to roll your sleeves up, get some containers, fill them with potting soil and plant the seeds of your favorite fruits, veggies and herbs. Don’t let space, or in this case, the lack thereof, prohibit you from eating fresh from the garden. Listen in as Mike gives you some vermicomposting tips. Click Here, for a full transcript of this podcast. You can use a variety of items to start your seeds in, from your garden's own soil, to a mixture of equal parts compost, perilite and peat. While other methods will be just as fun to do with your kids, mine really enjoyed using the seed starter pellets. This particular box of 72 (refills) cost me $5.99 at Home Depot. You can also buy a small propagation dome (you will see this shortly) which include the pellets. They range in price from $1.99 up through $9.99 depending on how advanced you want to get. Have your kids place the pellets in a plastic tray. The one in this photo is a smaller propagation dome that holds 12 pellets. It costs $1.99 at Home Depot and comes with the 12 pellets. Since I have had this one for a few years I needed to buy the replacement pellets as shown in the previous step. My 2 year old and 4 year old enjoyed putting the pellets in the tray. Using a plastic cup, fill with warm water...not hot and not cold ... WARM water. While the pellets will expand on hot water, it does not make for a great environment for the seeds. Cold water will "eventually" get the seed pellets to expand ... do you have an hour or so? Warm water will make them expand instantaneously. Here are what the pellets look like once they have expanded. Have your kids choose something they would like to grow. In my son's case, here we are planting broccoli. What can I say, I am lucky, the young man loves to eat broccoli, so growing it makes perfect sense. Just remember the smaller the seeds you choose the more likely your child will pick up A LOT of them at once and plant a bunch in each pellet. It's not really a big deal, you will have to go back later after they sprout to thin each pellet out. Once they reach the top of the dome, carefully use a pair of scissors and snip the extras leaving 1 or 2 plants behind. Using larger seeds makes this easier (i.e. squash, watermelon etc.). Have your child put the dome on top. This helps seal in the moisture and create a greenhouse. A constant temperature and moisture level will exist, making for a perfect seed starting environment. If you are using your own home made tray you can cover with clear plastic wrap and that will serve the same purpose. Place the finalized tray with pellets, seeds and dome on a window sill that receives sunlight first thing in the morning. For faster germination, place it on the same window sill NEAR (NOT ON) a heater vent. CAUTION: NEVER PUT IT ON THE HEATER VENT! And that's it! Your seeds should germinate in 5 to 7 days, probably sooner. Once they grow tall enough to where they can no longer fit under the dome, I like to plant them in their own individual pots, if the outdoor temps are not ready for transplanting. I was reading an article the other day in Mother Earth News magazine about a family in California that made a lifestyle change to be more self reliant and work hard towards being more self sustaining. One of the portions of the article talked about the important role their chickens played in tilling the land and adding their own manure to it so that they can grow fresh vegetables, fruits and herbs in fertile soil. It got me thinking about how every home vegetable gardener can incorporate manure into their own gardens, regardless of how big or small it may be. I am not saying to go out and get a flock of chickens anytime soon, although I know many of you do have them, but more so, what steps can you take to use manure in your own garden, to make sure your soil contains the nutrients it needs to keep producing great tasting vegetables, fruits and herbs. 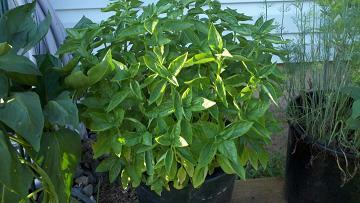 For help on this topic, I turned to Todd Heft who is the writer of the Big Blog of Gardening. Todd has been gardening for most of his life and focuses in on organic gardening, of which he feels manure must be a part of if you want to add the nutrients to your soil that your plants need to grow. Todd believes horse manure is the way to go. “First of all, new-to-manure folks should understand that there is no wicked smell from horse manure - not like your dog's waste. Horses eat a variety of vegetables and no meat so there are no offending parasites or bacteria in the waste to create a foul smell,” says Todd. 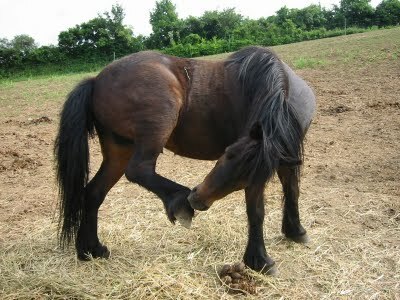 Todd also says that you should get a manure/straw mixture. This type of mixture is what many owners of horse stables in his area are trying to get rid of. The straw lightens the mixture and that helps break the manure down faster. Give the manure a couple of months to sit so it will break down before you add it to your home vegetable garden. This also helps in making sure that “rogue pathogens” are killed as the manure pile heats up. One of the best and maybe not thought about sources of finding good quality manure in your area is Craigslist. Todd hits Craigslist every spring to look for stables that want to give it away. Stables need to unload this “stuff” and they simply can’t throw it in the garbage so many will gladly give it to you if you are willing to go and pick it up. Todd is fortunate in his area that he has had been able to find stables willing to deliver it for a bucks to cover the cost of gas. I took Todd’s Craigslist challenge myself and did a search in my area for free manure. The list was longer then I had ever thought and I didn’t even realize horse stables existed in some of the towns that came up in the search. Do your own search right now and you will see for yourself. Now that you know what type of manure you should get and where to get it, it’s time to add it to the garden. So when should you do it? Manure should season first. Fresh manure added to your garden will create an unstable environment for the plants. Seasoned manure which has been broken down is better. What I learned is that if you have fresh manure and do not have the space to have a pile of it sitting around (or maybe the neighbors won’t appreciate it), add your manure in at the end of your growing season after your plants are done producing and then til it in. If you have seasoned manure, adding it in to your soil a week or two prior to planting should be ok.
Is this how your social networking is conducted? Click here for a full transcript of this podcast.